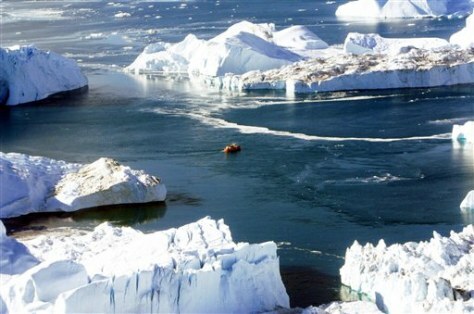 A small boat makes its way through the icebergs in Disko Bay, Greenland, on Aug. 17, 2005. The Titanic received seven heavy ice warnings, including one from the Californian less than an hour before the fateful collision. The message said: "We are stopped and surrounded by ice." Titanic sent back a message: "Shut up. We are busy."